David Sorenson is a fictional character that appears in Is It Fall Yet?. He was voiced by Carson Daly. David is hired by the Morgendorffers to tutor Quinn during the summer, as a result of her P-STAT scores. Quinn later says that he's "off to college" at the end of the summer, but what year of college he's in is never said. 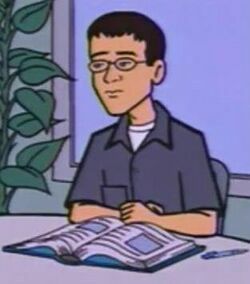 From his only appearance, it is seen that David is a serious and studious young man with little patience for lack of effort or concentration from his students. He also seems to have strong opinions on Quinn's mental capacities and the involvement of parents on studying. Besides Quinn, David has tutored Jasmine, with good results, and is seen trying to tutor the remaining members of the Fashion Club, with less stellar results. Sandi and Tiffany seemed basically indifferent to his efforts, causing him to drop them; Stacy tried to learn, but became neurotic whenever she made a mistake. Quinn develops a crush on him throughout the telefilm, her first truly serious infatuation - so serious she approached Daria for some covert input - even though he's the type of guy she states she never thought she'd fall for. When she expresses the crush to David, he tells her he's flattered but she's not his type, lacking the "certain amount of depth" he's after and stating that, by focusing solely on a "party school" for college and hanging with the Fashion Club, she's showing very low self esteem. He then tells her she's showing she's aware now of her potential and that he's glad & wishes her luck, but their worlds are too far apart. Quinn is deeply affected by his rejection, even crying for a moment when she discussed it with Daria. She also comments that she usually doesn't tell a guy when she actually likes them, a "rule" that she broke with David. MTV's feature "Love is a way too many splendored thing", a 'flipbook' of Quinn's admirers, has Quinn state her cover story: she was only pretending to like him for a better grade. "Really. Why are you looking at me?" Due to the crush Quinn harbours for David, they have often been described as a romantic pair in fanfiction. This page was last edited on 27 May 2018, at 14:57.